I was delighted to be invited to become a Brand Ambassador, marshals the length and breadth of the UK do a fantastic job supporting motorsport at all levels. While I hope not to meet too many of them on the side of the track this season, I’m extremely grateful for their support when needed! From the moment he first stepped into a kart at the age of eight, Martin Plowman showed race-winning prowess. After tasting that success, Martin dominated the 2003 French International Open Championship with four wins and seven podiums in ten events, crediting him as the first Briton and youngest winner of the series. His potential was further acknowledged in 2004 when he was elected as a member of the British Racing Drivers’ Club’s Rising Star program. Martin was selected as the sole factory driver for the newly formed Team Zanardi, and once again, he was quick to show results–winning the coveted CIK/FIA Asia Pacific Championship in only the team’s third outing. Stepping up to single-seaters for 2006, Martin joined Prema Powerteam and Toyota’s Young Driver Program to contest Formula Renault Italia and the Formula Eurocup series. Finishing an impressive fifth overall in Formula Renault Italia, Martin was ranked Top Rookie and notched up his first podium at Hockenheim amid an encouraging string of top-six finishes. Martin caught the eye of Volkswagen and signed for the closely-fought Formula 3 Euroseries with RC Motorsport for 2008, showing plenty of potential at elite events such as the Zolder F3 Masters. With VW’s blessing, Martin joined Panther Racing to contest the Indy Lights Series in 2009. A move into Indy Lights was more profound than just a change of class; 2009 would see Martin relocate to the United States and emerge himself into a year full of learning new tracks, cars, drivers, and of course, American culture. 2009 went by with many high points. Martin’s most memorable performances came at Long Beach where he battled for the Pole Position in only his second-ever race where he eventually qualified sixth. He also impressed by taking a very strong top-5 in tricky conditions on his very first oval race at Kansas, backing up that result with a solid drive at the Mid-Ohio road course, where he held off stiff competition to gift Panther Racing their first road course top 5 for nearly two years. By the close of the season, Martin was invited to drive in a shootout to compete for a ride with the championship-winning team Andretti Green Racing/AFS at Mid-Ohio. On the day, he successfully outpaced the other drivers and matched the times set by the reigning Indy Lights champion set at the previous race. He was subsequently offered a chance to drive for the team in 2010. Joining forces with Michael Andretti, Martin’s 2010 career was even more successful than his rookie year in Indy Lights. He dominated at Mid-Ohio, where he won the Sunoco Pole Award, set the Indy Lights track record, and took the checkered flag for his first Indy Lights victory. His hard work and willingness to learn earned him podium finished at Iowa Speedway and Edmonton, along with a pole position at Chicagoland Speedway. Martin finished the season in third place in the championship. The results spoke for themselves – Martin was ready to move into the IZOD IndyCar Series. During the off-season, Martin and “Team Plowey” worked tirelessly to secure a full-time ride in IndyCar. He tested in January with Dale Coyne Racing, getting up to speed in under ten laps and continuously leading the time charts. Team owners took notice of Martin’s abilities in an IndyCar, and by mid-season, he had signed to run three races with Sam Schmidt Motorsports. Martin once again impressed during his three races in the #17 car at Mid-Ohio, Sonoma, and Baltimore. He earned top-12 finishes at the Grand Prix of Sonoma and the Grand Prix of Baltimore, where he was also the top rookie finisher. His performance at Sonoma won him the prestigious Firestone Tire-riffic Award for most impressive race performance. 2012 brought significant challenges and exciting finishes for the young Brit. 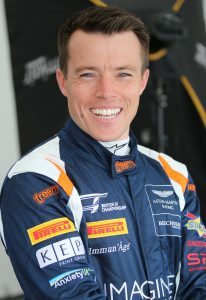 Martin joined Conquest Endurance in the American Le Mans Series, switching his career to sports cars. He led his underdog team to a second-place finish in the championship, winning two races, three pole positions, and finishing on the podium at every race. His performance turned heads in the American and international sports car worlds, as this talented young driver made some unbelievable performances on the track. His talent was noticed by OAK Racing, a strong team in the World Endurance Challenge that Martin raced beside at the 12 Hours of Sebring and Petit Le Mans. He signed to the team for the 2013 FIA/WEC racing season in the #35 Morgan/OAK LMP2 car and propelled the team to the top of the class. He concluded the season with two race wins, including the heralded 24 Hours of Le Mans, and clinched the championship in the LMP2 class. 2014 was an exciting year for Martin. He competed with A.J. Foyt Racing in the “Indy Double-Header,” consisting of the Grand Prix of Indianapolis and the Indianapolis 500. As an Indy 500 rookie, he raced the #41 A.J. Foyt Racing/ABC Supply/Honda car into 23rd place overall, finishing his first Indianapolis 500. He also partnered with BAR1 Motorsports to race in several TUDOR United SportsCar Championship races in the PC class, placing second at The Sahleen’s 6 Hours of Watkins Glen after coming back from a 2-lap deficit! in 2015 saw Martin racing both int he USA but also in Europe. Martin competed win the TUDOR United Sports Car Championship with BAR1 Motorsports in and Oreca LMPC car. A good season for Martin but the highlight was being Martin return to the podium in 3rd Place in the Sahleen’s 6 Hour of Watkins Glen. Martin also competed in Europe in the Blancpain GT Endurance Series racing for Nissan in their GTR-GT3. Martin had many successes throughout the year but his highlight has to be placing 5th at the 3 Hours of Silverstone and dual 8th Places in both Monza and Nurburgring. Martin continued his European racing into 2016, continuing in the Blancpain GT Championship but this time in the shorter Sprint Series for McLaren in the 650S GT3. In what was a challenging year with multiple technical challenges thwarting the teams efforts however Martin always give his best performance as demonstrated at the Nurburgring when he claimed 17 places in 2 laps, climbing from 38th to 21st on the grid. 2016 also saw Martin develop further into his driver coaching career. Most notably Martin supported Richard Taffinder and the UltraTek Racing for the final two rounds of the British GT Championship season as a precursor to a strong campaign in 2017. Martin continued with Richard development over the winter period and was instrumental in moving the UltraTek Team to it’s new home with RJN and Nissan. Martin also saw success coaching Emmerdale Actor Kelvin Fletcher during his maiden BTCC season. Martin supported Kelvin intensively at Silverstone and helped the BTCC star deliver his best qualifying of the year. Martin will race again with team mate Kelvin Fletcher this season, having joined Beechdean AMR in a fully liveried ‘Imagine Cruising’ GT4 Aston Martin.